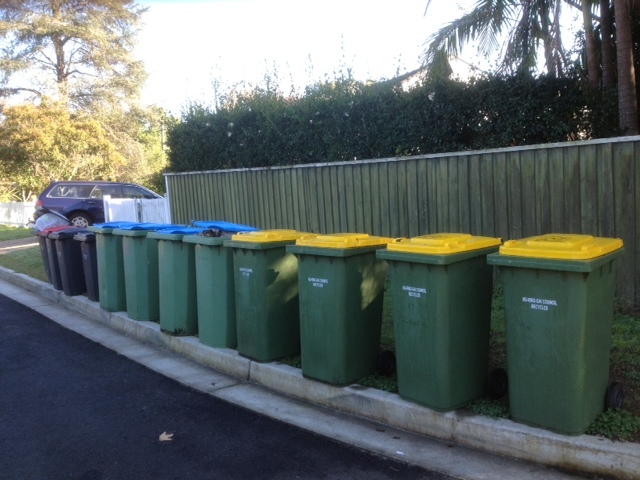 Here is a photo of grouped garbage cans in a cul-de-sac near our house on the North Shore of Sydney. This picture says a lot about neighbourliness in this small street: the residents have all decided (together?) to group their cans to make it easy for the local council trucks to empty them. We who live in the relatively low-density suburbs of Sydney rarely collaborate with neighbours like this. When you walk the streets of the suburbs on garbage pick-up day, you see more garbage cans than people. But here at least the cans have their own “community”. For those who do not know, the yellow bin is for paper, blue is for bottles/cans and black/red is for general rubbish. You are currently browsing the archives for the The suburbs category.